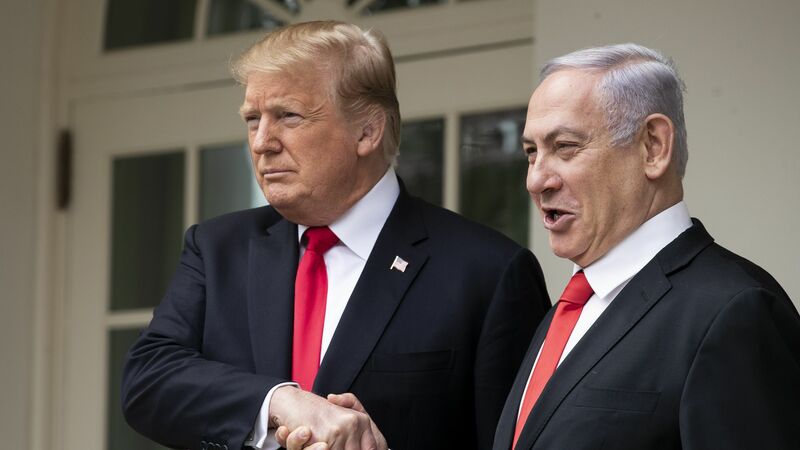 President Trump met at the White House today with Israeli Prime Minister Benjamin Netanyahu and signed a proclamation recognizing Israeli sovereignty over the Golan Heights. "Today, aggressive action by Iran and terrorist groups in southern Syria, including Hezbollah, continue to make the Golan Heights a potential launching ground for attacks against Israel — very violent attacks. ... This should have been done numerous presidents ago." The big picture: The official proclamation, which was announced by Trump earlier on Twitter, is a huge policy shift by the U.S. that could have repercussions for American policy towards other occupied areas in the world. Countries around the world have been critical of the decision. Russian Foreign Minister Sergey Lavrov spoke today to Secretary of State Pompeo and stressed that recognizing Golan Heights is "a flagrant violation of international law" and will create more tensions in the region, a Russian foreign ministry spokeswoman said. The signing ceremony came just as Israel's military announced it had begun striking Hamas targets in the Gaza Strip, after a Hamas rocket wounded 7 people in a village north of Tel Aviv. Netanyahu cut his Washington trip short as a result of the attacks and will fly back to Israel Monday afternoon.